Dr Lubik studied biochemistry/ molecular biology at Simon Fraser University in British Columbia, Canada, finishing in 2006 with Honours in HIV research, and a co-operative education certificate, having worked multiple semesters at the Vancouver Prostate Centre, and Merck Frosst Paramedical in Quebec, Canada. While attending University, Dr Lubik was heavily involved in the Red Cross Club, Doctors without Borders, and was president of the swing-dancing club. Following her honours project, Amy travelled to Ternopil, Ukraine, to teach HIV education in high schools and Universities. She then returned to Vancouver to work at the Prostate Centre, specifically on steroidogenesis and lipogenesis. 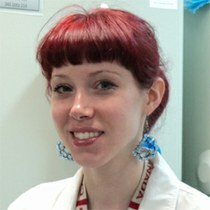 Dr Lubik completed her PhD in 2011 at Queensland University of Technology, Brisbane, Australia. During her PhD, she has been chairing the QUT movement for Universities Allied for Essential Medicines with great success, and doing an internship in neglected disease patent law with Cambia at QUT. Her thesis focused on insulin and IGF2 and their effects on prostate cancer progression. Her work has largely been interwoven with the Vancouver Prostate Centre and the Australian-Canadian Prostate Cancer Research Alliance. Her thesis earned a nomination for an outstanding thesis award. Dr Lubik continues to be interested in metabolism and prostate cancer; however, her current work for which she has earned a US Department for Defense Trainee Award focuses on a) the epithelial-stromal interactions that contribute to steroidogenesis to further prostate cancer and drug resistance, in both the local prostate and bone microenvironment; b) prostate cancer stem cell contributions to disease. She also volunteers with many social justice related causes, including her local chapter of Amnesty International. IGF-2, androgen action, androgen independence, insulin, metabolic syndrome, normal functioning, steroidogenesis, vaccines. Sieh S, Lubik AA, Clements JA, Nelson CC, Hutmacher DW. Interactions between human osteoblasts and prostate cancer cells in a novel 3D in vitro model. Organogenesis. 2010; 6(3):181-188. Locke JA, Guns ES, Lehman ML, Ettinger S, Zoubeidi A, Lubik A, Margiotti K, Fazli L, Adomat H, Wasan KM, Gleave ME, Nelson CC. Arachidonic acid activation of intratumoral steroid synthesis during prostate cancer progression to castration resistance. Prostate. 2010; 70(3):239-51. Locke JA, Fazli L, Adomat H, Smyl J, Weins K, Lubik AA, Hales DB, Nelson CC, Gleave ME, Tomlinson Guns ES. A novel communication role for CYP17A1 in the progression of castration-resistant prostate cancer. Prostate. 2009; 69(9):928-37. Locke JA, Guns ES, Lubik AA, Adomat HH, Hendy SC, Wood CA, Ettinger SL, Gleave ME, Nelson CC. Androgen levels increase by intratumoral de novo steroidogenesis during progression of castration-resistant prostate cancer. Cancer Res. 2008; 68(15):6407-15.